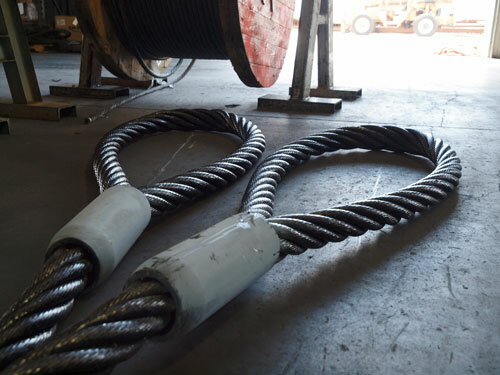 Wire rope slings and assemblies are the most common and rugged slings used today and can be made in single, double, triple and quadruple leg configurations. Wire rope sling assemblies can also be braided into multiple parts making them more flexible and able to handle higher capacity by increasing the diameter of the sling. Together, all Delta Rigging & Tools riggers are trained to fabricated wire rope slings with a flemished eye splice, not a Texas tuck or turn back eye splice. The end terminations of wire rope slings come in many configurations, but the most common ends for wire rope slings are standard eyes, heavy duty thimble eyes, swage sockets, and spelter sockets. 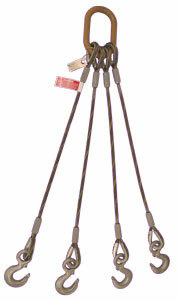 Specify rigging hardware attached to the end terminations: eye hooks, thimbles, standard eyes, sorting hooks, etc. 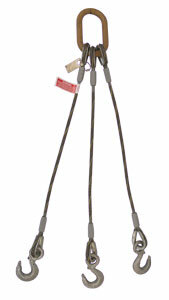 To order sling legs, choose the correct size from the tables below. Determine the length needed and specify the end fittings required from the list of combinations shown below. Two, three, and four leg spreaders will be fabricated with oblong Master links, unless otherwise specified. Min. Length Ft. - In.